Fleeing IDPs from Eachchilampathu and Muthur to Vaharai were caught in aerial attack and SLA artillery fire Wednesday evening when they were ferrying through Verugal River to Vaharai division in Batticaloa district. On Wednesday evening around 6.05 p.m. five IDP persons were killed in bombing by Kfir jets and several others injured at Verugal. About thirty five thousand people of around seven thousand families displaced from Muttur east and Eachchilampathu division seeking refuge in Vaharai division in Batticaloa district till Wednesday. The IDP's have been facing starvation due to the non-supply of food materials and urgent medical assistance. The IDP's are forced to live under shades of trees and other available space. Drinking water and sanitary problems prevail in Vaharai area. Human and civil rights sources say that a massive humanitarian crisis is to explode in Vaharai as authorities concerned are neglecting the urgent needs of these IDPs in this region. Following the Muthur crisis, Muslim and Sinhalese IDPs displaced are sheltered in Kantalai, Kinniya and Trincomalee and are now being provided with food ration and other assistance in plenty by the government authorities. However the Tamil people displaced from LTTE held areas due to artillery fire by the Sri Lanka Army are not being provided with the same facility by the government authorities. "This is a blatant discrimination by the Government of Sri Lanka," said a NGO worker. Government security forces manning checkpoints at Panichchankerni, the gateway to Vaharai from Batticaloa district are not allowing international and national non-governmental organizations (INGO and NGO) to take relief goods to Vaharai to be distributed among IDPs. Only the Tamil Rehabilitation Organization (TRO) has been supplying cooked meals and other food materials to these IDPs. TRO sources said the stock of food and other essential materials available in Vaharai could last only for one or two days if the INGO and NGOs are not allowed to enter Vaharai with enough food and materials. Thereafter IDPs could face death due to starvation and disease, TRO sources lamented. Meanwhile the influx of refugees from Muttur east and Eachchilampathu division to Vaharai is increasing daily following continuing artillery fire by the SLA towards these LTTE held areas. 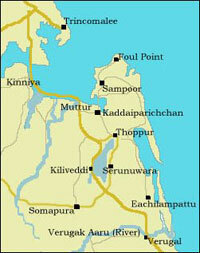 The Sri Lanka Army has been shelling Tamil villages in the Muthur east and Eachchilampathu division continuously from several military installations located in Trincomalee and its suburbs. Wednesday too artillery fire is continuing from morning, sources said. Due to the indiscriminate artillery attack by the SLA several permanent houses and temporary houses constructed under the tsunami reconstruction projects implemented by INGOs and NGOs have been damaged, sources said.